Korean dramas (Hangul: 한국드라마; RR: hanguk drama), or K-dramas, are television series (Hangul: 드라마; RR: deurama) in Korean language, made in South Korea. Korean dramas are popular worldwide, partially due to the spread of Korean popular culture (the "Korean Wave"), and are available through streaming services that offer multiple language subtitles. They have received adaptations throughout the world, and have had an impact on other countries. Some of the most famous dramas have been broadcast via traditional television channels; for example, Dae Jang Geum (2003) which was sold to 91 countries. South Korea started to broadcast television series in the 1960s. In the 1990s traditional historical series transformed into the present miniseries format, creating the notion of fusion sageuks. One director usually helms Korean dramas and is written by one screenwriter, thus having a distinct directing style and language, unlike American television series, where often several directors and writers work together. Series set in contemporary times usually run for one season, for 12−24 episodes of 60 minutes each. Historical series may be longer, with 50 to 200 episodes, but they also run for only one season. The broadcast time for dramas is 22:00 to 23:00, with episodes on two consecutive nights: Mondays and Tuesdays, Wednesdays and Thursdays, and weekends. Different dramas appear on each of the nationwide networks, Seoul Broadcasting System (SBS), Korean Broadcasting System (KBS), Munhwa Broadcasting Corporation (MBC) and on the cable channels, Joongang Tongyang Broadcasting Company (jTBC), Channel A, tvN, and Orion Cinema Network (OCN). The 19:00 to 20:00 evening time slot is usually for daily dramas that run from Monday through Friday. Dramas in these slots are in the telenovela format, rarely running over 200 episodes. Unlike American soap operas, these daily dramas are not also scheduled during the day-time. Instead, the day-time schedule often includes reruns of the flagship dramas. The night-time dailies can achieve very high ratings. For example, the evening series Temptation of Wife peaked at 40.6%, according to TNS Korea. Korean dramas are usually shot within a very tight schedule, often a few hours before actual broadcast. Screenplays are flexible and may change anytime during production, depending on viewers' feedback, putting actors in a difficult position. Production companies often face financial issues. Sageuk refers to any Korean television or film drama that is either based on historical figures, incorporates historical events, or uses a historical backdrop. While technically the word sageuk literally translates to "historical drama", the term is typically reserved for dramas taking place during Korean history. Since the mid-2000s sageuks have achieved major success outside of Korea. Sageuks including Dae Jang Geum (a.k.a. Jewel in the Palace), Yi San and Jumong enjoyed strong ratings and high satisfaction ratings in countries such Vietnam, Uzbekistan, Kazakhstan, Fiji and Iran. Jumong, which aired on IRIB (Islamic Republic of Iran Broadcasting) in 2008, had 85% viewership. Often centred on a love story, series set in contemporary times put family ties and relationships in the focus. Characters are mostly idealised, with Korean male protagonists described as handsome, intelligent, emotional and in search of "one true love". This has also been a contributing factor to the popularity of Korean dramas among women, as the image of Korean men became different from that of other Asian men. Actress Lee Young-ae played the titular Dae Jang Geum in the series of the same name. Radio broadcasting, including the broadcasting of radio dramas in Korea, began in 1927 under Japanese rule, with most programming in Japanese and around 30% in Korean. After the Korean War, radio dramas such as Cheongsilhongsil (1954) reflected the country's mood. Television broadcasting began in 1956 with the launch of an experimental station, HLKZ-TV, which was shut down a few years later due to a fire. The first national television channel was Korean Broadcasting System (KBS), which started up in 1961. The first Korean television film was a 15-minute piece titled The Gate of Heaven (천국의 문, Cheongugui mun), on HLKZ-TV. The first television series was aired by KBS in 1962. Their commercial competitor, Tongyang Broadcasting (TBC), had a more aggressive program policy and aired controversial dramas as well. The first historical TV series aired was Gukto manri (국토만리), directed by Kim Jae-hyeong (김재형), depicting the Goryeo era. In the 1960s, television sets were of limited availability, thus dramas could not reach a larger audience. In the 1970s, television sets started to spread among the general population, and dramas switched from portraying dramatic historical figures to introducing national heroes like Lee Sun-shin or Sejong the Great. Contemporary series dealt with personal sufferings, such as Kim Soo-hyun's influential Stepmother (새엄마, Saeeomma), aired by Munhwa Broadcasting Corporation (MBC) in 1972 and 1973. As technology and funding was limited, Korean channels could not make series in resource-heavy genres like action and science fiction; American and other foreign series were imported instead. The 1980s saw a change in Korean television, as color TV became available. Modern dramas tried to evoke nostalgia from urban dwellers by depicting rural life. Kim Soo-hyun's first real commercial success, Love and Ambition (사랑과 야망, Saranggwa yamang), aired on MBC in 1987 and is regarded as a milestone of Korean television, having recorded a 78% viewership. "Streets became quiet at around the airing time of the drama as 'practically everyone in the country' was at home in front of the TV", according to The Korea Times. The most outstanding classical historical series of the era is considered to be 500 Years of Joseon (조선왕조500년, Joseonwangjo 500 nyeon), a serial that ran for eight years, consisting of 11 separate series. The serial was produced by Lee Byung-hoon, who later directed one of the biggest international successes of Korean drama, Dae Jang Geum. The 1990s brought another important milestone for Korean television. As technology developed, new opportunities arose, and the beginning of the decade marked the launch of a new commercial channel; Seoul Broadcasting System (SBS), which facilitated and re-initiated a race for catching viewers' attention. The first real commercial success among Korean television series was Eyes of Dawn (여명의 눈동자, Yeomyeongui nundongja), aired in 1991 by MBC, starring Chae Shi-ra and Choi Jae-sung. The series led the viewers through turbulent times from the Japanese rule to the Korean War. New channel SBS also produced successful series, one of them being Sandglass in 1995. Sandglass was a "trendy drama", which the Korean Culture and Information Service considers an important milestone, having changed the way Korean dramas are made by introducing a new format. In this decade, the new miniseries format became widespread, with 12 to 24 episodes. This era marked the start of export for Korean dramas, setting off the Korean Wave. The beginning years of the 2000s gave birth to a new genre, called "fusion sageuk", essentially changing the ways to produce historical series, with successful pieces such as Hur Jun, Damo and Dae Jang Geum. Song Joong-ki of Descendants of the Sun is considered a top star. Korean series were originally produced in house by the television channels themselves, but have been outsourced to independent production companies since the 2000s. In 2012, as much as 75% of all K-dramas were produced this way. Competition is fierce among these companies; out of 156 registered firms, only 34 produced dramas were actually aired in 2012. The budget of the production is shared between the producing company and the broadcaster, with the broadcasting channel covering around 50% of expenses usually. If top stars and famous scriptwriters are employed, they may cover even more. The rest of the budget has to be brought in by the production company with the help of sponsors. In the case of product placements, income is shared by the producer and the channel. The channel keeps 100% of the advertisement income during airtime; this could amount to ₩300-400 million. A typical Korean drama may cost as much as ₩250 million per episode, and historical dramas cost more than that. For example, Gu Family Book cost ₩500 million per episode. Producer Kim Jong-hak spent as much as ₩10 billion on Faith, which was considered a commercial failure, resulting in the inability of Kim to pay crew salaries and other overheads. Kim, who had produced successful dramas such as Eyes of Dawn and Sandglass, committed suicide after he was accused of embezzlement. In Korea, much of the budget is spent on the appearance fees of top stars. In some cases, the actors may take up as much as 55-65% of the whole budget, while it is 20–30% in Japan and roughly 10% in the United States. Everything else, including salaries of lesser-known actors, extras, and technical staff, location rent and other expenses, have to be covered from the remaining amount. Often, production companies overrun their budgets and cannot pay salaries. In 2012, actors held a demonstration in front of the headquarters of KBS, expressing their concerns. Actors are usually paid after the last episode is aired at the end of the month. In series made by smaller production companies for cable channels, there have been cases where the companies went bankrupt and could not pay their actors and crew, while the channel denied all responsibility, claiming all liability was with the bankrupt production firm. The biggest stars may earn as much as ₩100 million per episode. Bae Yong-joon, the star of Winter Sonata reportedly received ₩250 million per episode for The Legend in 2007. Kim Soo-hyun in costume for the sageuk Moon Embracing the Sun, Soo-hyun is one of the most popular Korean actors. As producing a series involves high expenses, production companies seek to shoot the episodes in the shortest time possible. In contrast to practices elsewhere, the first four episodes of Korean series are usually shot in advance, but the rest are shot continuously as the series is being aired. Scripts are not finished in advance, and may change according to viewer feedback and viewership ratings. These changes may occur a few hours before daily shooting, and the crew might receive only a few ready pages. The production usually works with three camera crews, who work in a rotating manner to speed up filming. Because of unregulated script changes and tight shooting schedules, actors are almost continuously on standby, and have no time to leave the set or sleep properly. The Korean media have a separate word to describe irregular, short sleeps that actors resort to, in often uncomfortable positions, or within the set: jjok-jam (쪽잠), or "side-sleeping". Dramas usually air two episodes a week, one after the other, with the following episodes having to be shot within the intervening five days. Some Korean actors have admitted to receiving IV therapy during filming, due to extreme schedules and exhaustion. Production teams originally sent two tapes to the channels; a primary copy and a backup copy. However, due to the tight filming schedules, a 70-minute episode might arrive at the broadcasting station on seven separate tapes in ten-minute installments. It happens that while the episode is being broadcast, the crew would be still shooting the last minutes or cutting the rest of the episode. During the airing of the nineteenth episode of Man from the Equator, screens countrywide went black for 10 minutes. Actor Kwon Sang-woo was openly complaining that he was still shooting Queen of Ambition 30 minutes before the last episode began airing. In South Korea, some production teams still do planning and scheduling manually, instead of using dedicated software. From late 2015 onwards due to the popularity of Korean dramas abroad, especially the success of My Love from the Star in China, producers have increasingly been pitching and pre-selling the overseas broadcast and streaming rights of their dramas. This has given production teams the budget to move away from the live shoot basis to one in which the drama is completed before broadcast. In 2016, dramas such as Descendants of the Sun, Uncontrollably Fond, Moon Lovers: Scarlet Heart Ryeo and Hwarang: The Poet Warrior Youth were all pre-produced before airing. The larger broadcasting companies have their own dedicated shooting locations for historical dramas, with extensive and elaborate sets. 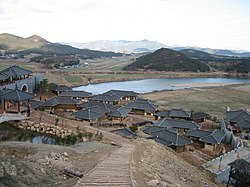 MBC's series are shot at MBC Drama in Gyeonggi, while KBS dramas utilize the Mungyeongsaejae Studio (문경새재 KBS촬영장) in North Gyeongsang and their studio in Suwon. The leading actors of Korean dramas have become popular outside of South Korea, due to the Korean Wave. In the 2000s, it became customary to cast popular K-pop idols in dramas. Their critical reception is mixed, however, some of them became successful as actors. Scriptwriters and directors of Korean dramas are often as well known as actors are. An overwhelming majority of scriptwriters (90% according to the Beijing Metro Reader) are women, who not only write love stories but action series as well. Compared to Korean cinema, television is more appealing for scriptwriters as contract conditions are better, acknowledgment is greater, and the salary is higher. Famous scriptwriters tend to have a say in their field. The most well-known scriptwriters include the Hong sisters, who wrote popular series such as My Girl, You're Beautiful and My Girlfriend Is a Nine-Tailed Fox; Kim Eun-sook, the screenwriter of Lovers in Paris, Secret Garden, The Heirs, Descendants of the Sun and Guardian: The Lonely and Great God; Lee Kyung-hee, famous for I'm Sorry, I Love You and The Innocent Man; male writer Choi Wan-kyu of Midas and Triangle; Noh Hee-kyung, the author of That Winter, the Wind Blows; and It's Okay, That's Love; and Park Ji-eun, who wrote My Husband Got a Family and My Love From the Star. Acknowledged TV directors include Lee Byung-hoon, who directed Dae Jang Geum and Yi San; Kim Jong-hak, the director of Eyes of Dawn, and Sandglass; and Pyo Min-soo, the director of Full House and Iris II. While scriptwriters are mostly women, directors are usually men. Some female directors have risen to prominence, such as Lee Na-jeong (이나정), who directed The Innocent Man, and Lee Yun-jeong (이윤정), whose most famous works are The 1st Shop of Coffee Prince and Heart to Heart. The latter director is also the first female television producer employed by Munhwa Broadcasting Corporation (MBC). Balladeer Baek Ji-young has been named "OST Queen" after providing the songs for several hit dramas such as Secret Garden (2010) and Love in the Moonlight (2016). Music plays an important role in Korean dramas. Original soundtracks, abbreviated OST, are explicitly made for each series, and in contrast to American series, fans have a need to buy the soundtrack album of dramas. This trend started in the 1990s, when producers swapped purely instrumental soundtracks for songs performed by popular K-pop singers. Tom Larsen, director of YA Entertainment, a distributor of Korean TV series, thinks that Korean soundtracks are polished enough musically to be considered standalone hits. During the 2000s, it became customary for lead actors to participate in original soundtracks, also partially due to the employment of K-pop stars as actors. Actor Lee Min-ho, and leader of boy band SS501, Kim Hyun-joong both recorded songs for Boys Over Flowers, while the actors of You're Beautiful formed a fictional band and held concerts, where they perform the soundtracks live. OST songs of popular K-dramas can also become hits on regular music charts, with good sales of both physical and digital albums. The chart performance of the OST songs usually co-relate to the popularity of the drama. Songs from the OST of Secret Garden for example, had high digital sales and high rankings on music charts. My Destiny, performed by Lyn for My Love from the Star, led music charts in Hong Kong, Taiwan, South Korea, and other Asian countries. It also won the Best OST award at the 2014 Baeksang Arts Awards. The soundtrack album of You're Beautiful sold 57,000 physical copies. Performers of OST songs for action series Iris held two concerts in Japan in front of an audience of 60,000 people. OST composers usually look for singers who have previously had success in the genre. Songs are written to reflect the mood of the series and their structure. Sometimes performers give their own songs for a series. For example, Baek Ji-young thought her song That Man, originally written for her own album, would fit Secret Garden. There are popular OST singers who are often employed, like Baek Ji-young, Lyn Seung-cheol, and Lee Seung-cheol. Sometimes, foreign singers are invited to perform songs for Korean OST. For instance, Swedish artist Lasse Lindh sang several songs for series like Angel Eyes, Soul Mate, I Need Romance, and Guardian: The Lonely and Great God. : programs that may be inappropriate for children under 12, such as mild violence, themes or language. : programs that may be inappropriate for children under 15. Most dramas and talk shows are rated this way. These programs may include moderate or strong adult themes, language, sexual inference, and violence. : programs intended for adults only. These programs might include adult themes, sexual situations, frequent use of strong language and disturbing scenes of violence. According to a researcher at the University of Vienna, popularity of Korean dramas have their foundation in Confucian values they transmit, which Asian viewers can easily identify with. Respect for elders, filial piety, family-orientedness, and the display of perceived "Asian moral values" play an important role in Korean series. YA Entertainment, the American distributor of Korean dramas, believes that part of the attractiveness of these series come from the quality of camera work, scenic locations, and spectacular costumes, which make the "final product is very stylish and attractive, with arguably some of the highest TV production values in the world." Korean series follow their own formula, are innovative and don't conform to Western television productions. Stephan Lee from Entertainment Weekly called Korean dramas "fascinating and weirdly comforting". Exports of Korean series yielded US$37.5 million in 2003, which was three times higher than the amount reached in 1999. According to data from Korea Creative Content Agency, in 2013 K-dramas constituted 82% of the culture content export of South Korea, with an income of $167 million, which is four times more than a decade before. A driving force behind the rising popularity is the intense involvement of fans. Because of the live-shooting production of K-dramas, Korean-speaking fans have the opportunity to participate in their creation —a unique phenomenon in the mass media world. They can influence the content of later shows in the series through complaints and suggestions, which are frequently adopted by the production teams. The global community of non-Korean-speaking fans, on the other hand, is more involved in the consumption aspects: Fans share their opinions through tweets and comments on newsgroups (for example, the Soompi discussion forum) as well as reviews and recaps on websites and blogs. However, the impact of their social media activity goes beyond the fan community. It spreads the word about the K-drama genre to social connections like acquaintances, friends and family (e.g. Facebook friends or followers on Twitter) and thereby generally raises its popularity. But it also has an effect on the creation of new dramas. It influences the popularity of certain dramas, leading to higher demand for those videos from streaming sites and additional income for broadcasters. When a substantial profit results, it raises not only the prestige of people involved in the production but also provides feedback for production teams and indirectly influences future productions. Won Bin gained wide popularity in 2000 after starring in the television drama Autumn in My Heart and has since gained critical acclaim for his performances in the films Taegukgi, Mother and The Man from Nowhere. Korean dramas have gained popularity in Bangladesh in recent years. Their rising popularity in the country has led to the Korea Foundation for International Culture Exchange (KOFICE), an organisation which aims to distribute Korean dramas for free to countries, cooperating with broadcasters to distribute Korean dramas for free in the country. In the Himalayan kingdom of Bhutan, Korean dramas and entertainment have gained popularity particularly amongst youth. Prior to interest in Korean entertainment, Bollywood had largely been the most popular form of entertainment in the country. When the Bhutanese film industry launched in the mid-1990s, Bollywood was the only form of influence on the industry. However, in recent years Korean entertainment has made significant inroads in the country and influence the entertainment industry alongside Bollywood. Korean entertainment has managed to influence fashion, and many video shops now sell Korean dramas and movies alongside Bollywood films. The interest in Korean entertainment has also led to controversy with older generations voicing their concern that Korean entertainment will deteriorate Bhutanese culture and traditions. In recent times Korean dramas have experienced growing popularity in Brunei. The growing impact of Korean culture in Brunei led to the hosting of the ninth Korea Forum in the country at Universiti Brunei Darussalam in 2010. Korean television dramas, movies, music, and clothing have had a great impact on the people of Brunei. The first Korean drama to be broadcast in Cambodia was Winter Sonata; it was, however, Full House that launched the interest in Korean dramas and entertainment in the country. Following the success of Full House, more Korean dramas have been dubbed into the Khmer language. Korean dramas have become popular particularly amongst youth in Cambodia. In China, South Korean programs on Chinese government TV networks accounted for more than all other foreign programs combined in 2006. Hong Kong has its own channel for airing Korean dramas, TVB J2, but ATV also airs Korean series in prime-time slots.My Love from the Star received enthusiastic feedback from China. It was viewed 40 billion times on numerous Chinese video sites. The drama also spurred interest about Korea, shown by China's increased consumption of Korean products such as Chi Maek (chicken and beer) and Korean cosmetics. Due to the success of Korean dramas in China, some dramas have been compiled to create feature-length films by combining all episodes into one film. The prodigious popularity of Korean dramas in the country has, on some occasions, been caught in the crossfire over diplomatic issues between China and South Korea. Most notable being the THAAD deployment in South Korea which resulted in the blocking of Korean dramas on streaming services across the country in late February 2017. Following the block, Chinese TV shows showcasing Chinese culture and other similar content replaced Korean content on TV networks' prime time schedules in the country. In November 2017, the ban was uplifted unannounced following the appearance of Kpop groups on national TV and the move to resume importation of Korean dramas by Chinese streaming services. Korean dramas have become popular in India, particularly in Northeast India in states such as Manipur, Assam, Meghalaya, Sikkim, Arunachal Pradesh, Tripura, Mizoram and Nagaland as well as parts of East India and more recently in Tamil Nadu. Hindi films and TV serials were banned in Manipur in 2000. As a result, local television stations began broadcasting subtitled Korean dramas instead. Many young people in northeast India, West Bengal and Tamil Nadu mimic the hairstyles and clothes of Korean actors and Korean fashion has become very popular in the region. As a part of cultural exchange, Indian Public Broadcaster telecasted Emperor of the Sea and Dae Jang Geum. Korean dramas have aired in the Tamil language in Tamil Nadu on Puthuyugam TV. In Indonesia, Korean dramas have gained popularity and the popular Korean dramas Winter Sonata and Endless Love were aired on Surya Citra Media in 2002. Some Korean dramas have also been remade into Indonesian versions such as Demi Cinta in 2005 which was a remake of the popular drama Autumn in My Heart and Cinta Sejati, a remake of Stairway to Heaven. RCTI and Indosiar are examples of Indonesian television networks that air Korean dramas. The first Korean drama to gain widespread popularity in Japan was Winter Sonata, which was broadcast on the NHK satellite channel NHK BS2 in 2003. The program was aired twice in the same year due to high demand from viewers. NHK also hosted a classical concert featuring Winter Sonata's tunes performed by Korean musicians. Korean dramas boost tourism between Korea and Japan, and is considered a possible way of improving strained relationships between the two countries, as series have become increasingly popular with Japanese viewers. Conversely, the series Iris had several pivotal scenes shot in Akita, Japan, which led to an increase of Korean tourists in that part of Japan. Actor Lee Min-ho achieved pan-Asia popularity with his hit dramas Boys Over Flowers (2009), The Heirs (2013) and The Legend of the Blue Sea (2016). The popularity of Korean dramas and pop culture in Laos has led to many Laotian tourists travelling to South Korea. Korean pop culture has gained popularity in Laos through the Thai TV channels broadcasting Korean dramas and K-pop bands in the country. In Malaysia, Winter Sonata began airing on TV3 in 2003, which started an interest in Korean pop culture in the country. Dae Jang Geum and Autumn In My Heart were also aired in Malaysia. The popularity of Korean dramas have resulted in a positive reception of Korean expatriates in Malaysia. In Mongolia, Korean dramas have become popular and are broadcast at prime time. Dae Jang Geum achieved success in the country and was broadcast five times due to this. Autumn in My Heart, Winter Sonata and Stairway to Heaven were other popular dramas. Popularity in Korean dramas has resulted in interest in the learning of the Korean language as well as Mongolians travelling to South Korea. It has also led to increased mutually cooperative relations between Mongolia and South Korea. In Myanmar, the K-drama Autumn in My Heart was broadcast in the country in 2001, which led to interest in Korean entertainment. When Dae Jang Geum was on air, the drama sparked an interest in Korean cuisine in the country. The rising popularity of Korean dramas and music in Myanmar has led to the Korea Foundation for International Culture Exchange (KOFICE) distributing Korean dramas in the country for free. Interest for Korean dramas in the Nepal began when Winter Sonata aired on Kantipur Television Network in the mid-2000s. This led to the popularity of other K-dramas such as Boys Over Flowers, Autumn In My Heart, You Are Beautiful and Full House to name a few. Popularity of Korean media products has also led to interest of learning the Korean language and has resulted in the emergence of Korean language tutorials that air on ABC Television in the country. Korean dramas have become popular among Nepali youth and markets are often frequented by teenagers looking to buy the latest dramas. The hairstyles and fashion of Korean actors have influenced the fashion sense of Nepali youth. Fascinated by the lifestyle and food of Korea, restaurants serving Korean cuisine have also been established in the country. Watching films or TV dramas from South Korea is a serious offence in North Korea, punishable by execution, but people still manage to acquire them on CDs and DVDs. In the Philippines, Autumn in My Heart ignited the interest in Korean dramas when it was aired on GMA Network in 2003. Korean drama frenzy came to its peak point when Lovers In Paris was aired in ABS-CBN in 2004. GMA Network, ABS-CBN and TV5 regularly air Korean dramas dubbed in the Filipino language. In Singapore, Prime 12 (now known as Suria) originally aired the Korean drama Sandglass on a weekly basis in 1996 and aired Asphalt Man in 1997. Since 2001, they are shown on Chinese language channel MediaCorp Channel U daily. The launch of KBS World, ONE TV ASIA, Oh!K, Channel M and streaming app, Viu in Singapore allows viewers to watch Korean dramas with a variety of subtitles in a matter of hours after the original South Korean telecast. In Sri Lanka, the Independent Television Network aired Full House in 2009 and it proved popular. Dae Jang Geum aired on Rupavahini in 2012 and was dubbed in Sinhala under the title Sujatha Diyani (සුජාත දියණී), meaning "The Pure, Valuable Daughter" and received a viewer rate of over 90%. The Independent Television Network, Rupavahini, TV Derana, Sirasa TV, Swarnavahini and TV1 air Korean dramas dubbed in the Sinhalese language. Streaming service, Iflix also streams many Korean dramas with English and Sinhalese subtitles in the country, some as early as 24 hours after their original Korean broadcast. Additionally, the popularity of Korean pop culture in the country has led to an increasingly warm reception towards Korean people. In Taiwan, interest in Korean dramas began when Star in My Heart aired in 1999. Since then Korean dramas have become very popular and according to the South Korean mission 120 K-dramas had been broadcast in Taiwan in the first half of 2011. When Dae Jang Geum was on air in Thailand, Korean food started gaining wide popularity. Due to the lop-sided nature of entertainment exports favoring South Korea, the Thai government requested increased introduction of popular Thai films to South Korean media outlets. This led to the signing of an Agreement of Cultural Cooperation between the two countries in August 2004. Korean dramas have also gained popularity in Vietnam, particularly among women and young people. The fashion and hairstyles presented in Korean dramas have become very popular among the youth of the country. The Asian American-targeted cable TV channels AZN Television and ImaginAsian aired Korean dramas alongside content from China, Japan, India, Thailand and other parts of Asia. The dramas were aimed at the Asian American community before the channels dissolved in 2008 and 2011 respectively. In November 2008, Netflix  began offering several Korean dramas as part of its video selection. In August 2009, DramaFever began offering free subtitled video streaming service, with video advertisements, in the United States. Singapore-based Viki streams popular Korean dramas across the world including North America, with subtitles in 70 languages. Companies in Asia have also designed streaming services available online and as mobile apps targeted towards overseas Asian communities. "MobiTV" created by the Sri Lankan company, Bhasha is a streaming service and mobile app aimed at the Sri Lankan community and streams Korean dramas dubbed in the Sinhalese language alongside other content aired in Sri Lanka. "Roopa", created by the same company, is another service available as a mobile app also aimed at the Sri Lankan community, it too streams Korean dramas dubbed in the Sinhalese language. Chinese company PPTV is another example, a mobile app, "PPTV网络电视HD" streams Korean dramas aimed at the Chinese community alongside content that is primarily available in Mandarin, Cantonese and Korean but also increasingly in English. Additionally, Korean dramas are available at online DVD retailers. Some Korean dramas, however, are not available for region 1 (North America) encoding and NTSC video format. Amazon offers streaming of Winter Sonata for a fee. KBFD-DT in Honolulu, Hawaii broadcasts a majority of Korean dramas on its daily schedule, as well as offering the programs on sale at its website and on demand through its K-Life channel on Oceanic Time Warner Cable. Another Honolulu outlet, KHII-TV devotes three hours of its Sunday afternoon schedule to Korean dramas. KTSF, a channel aimed at the Asian American community in San Francisco, California airs Korean dramas as part of its schedule alongside content in Mandarin, Tagalog, Hindi, Korean, Vietnamese, Japanese, Taiwanese and Cantonese. The list was compiled from data by AGB Nielsen Media Research, based on the episode of the highest viewership since 1992, when AGB Nielsen entered the Korean market. The following dramas air on a cable channel/pay TV which normally has a relatively smaller audience compared to free-to-air TV/public broadcasters (KBS, SBS, MBC & EBS). ^ "Korean Drama Effect On Cultural and Feminist Theory (with images, tweets) · pattyptrb". Storify. ^ "Why Korean Dramas Are Popular". ReelRundown. ^ 박세연 (13 February 2009). '아내의 유혹' 40.6% 자체 최고 시청률 '기염'. Newsen (in Korean). Retrieved 11 October 2012. ^ Tourism, Korean Culture and Information Service Ministry of Culture, Sports and (2012-08-18). K-Drama: A New TV Genre with Global Appeal. 길잡이미디어. ISBN 9788973751679. ^ a b c d Lee 2005. ^ Robinson 1998, pp. 358–378. ^ a b Do Je-hae (3 February 2012). "Book traces history of Korean TV dramas: Analysis on Koreans' fervor for soap operas". The Korea Times. Retrieved 6 December 2013. ^ KOCIS 2011, p. 59. ^ Jeon 2013, pp. 69-70. ^ KOCIS 2011, pp. 61-62. ^ a b c d X 2007. ^ 국토만리(國土萬里) (in Korean). National Institute of Korean History. Retrieved 2014-06-02. ^ a b c X 2009. ^ Jeon 2013, p. 70. ^ Jeon 2013, pp. 70-71. ^ a b KOCIS 2011, p. 63. ^ a b c KOCIS 2011, p. 65-66. ^ Jeon 2013, p. 72. ^ a b c d Kim 2013a. ^ "Police Confirm Producer Kim Jong Hak's Death". Mwave. 2013-07-23. Retrieved 2014-06-04. ^ Kim, Tong-hyung (2013-07-23). "Director of Hourglass commits suicide". The Korea Times. Retrieved 2013-07-29. ^ a b c Kim 2013b. ^ a b Donga 2 2013. ^ "Kim Soo Hyun's net worth is now S$1.2 million?". XIN MSN. 2014-03-03. Retrieved 2014-06-05. ^ "What makes Kim Soo-hyun so popular in China?". Korea Herald. 2014-01-22. Retrieved 2014-06-05. ^ "Kim Soo Hyun Sleeps Only 1 Hour? The Reality of Drama Filming Schedules". Soompi. 2014-02-01. Retrieved 2014-06-04. ^ a b Donga 1 2013. ^ Kil, Sonia. "Korean Dramas Adopt Pre-Produced Format to Mixed Results". Variety. Retrieved 2017-10-20. ^ "Dramas Shot in Dramia". MBC Dramia. Retrieved 2014-01-12. ^ "Mungyeongsaejae KBS Drama Studio". Korea Tourism Organization. Retrieved 2014-06-06. ^ "KBS Suwon Studio". Korea Tourism Organization. Retrieved 2014-06-06. ^ KOCIS 2011, pp. 90-109. ^ "Top 7 successful idol-turned-actors". Korea Herald. 2013-06-12. Retrieved 2014-06-05. ^ "90% of South Korean TV Writers Are Women". Women of China. 2014-03-24. Retrieved 2014-06-06. ^ "Wanted : Good Screenwriters". Koreanfilm.org. 2010-12-01. Retrieved 2014-06-06. ^ "Meet the screenwriters responsible for your Kdrama tears". DramaFever. 2013-09-12. Retrieved 2014-06-06. ^ "Kim Jong-hak to direct 'Magic Bell'". Variety. 2009-05-18. Retrieved 2014-06-06. ^ "Producer Pyo Min Soo of 'Full House' and 'Worlds Within' to Direct 'Iris 2'". Mwave. 2012-09-27. Retrieved 2014-06-06. ^ "610화 여성 드라마 감독 이윤정PD 인터뷰!" (in Korean). iMBC. 2005-02-03. Retrieved 2014-06-06. ^ 이나정 (in Korean). Daum Movie. Retrieved 2014-06-06. ^ "The First Shop Of Coffee Prince". Korea Tourism Organization. Retrieved 2013-05-03. ^ Jeongmee Kim (2013). Reading Asian Television Drama: Crossing Borders and Breaking Boundaries. I.B.Tauris. p. 197. ISBN 978-1-84511-860-0. ^ "K-Drama Original Soundtracks: What Is The Significance Of Actors Singing On Their Own OST?". KpopStarz. 2013-11-13. Retrieved 2014-06-04. ^ '미남' 꽃미남 그룹 에이엔젤, 공개 미니 콘서트 연다! [A.N.JELL to hold a second mini-concert]. BNTNews (in Korean). 21 November 2009. Retrieved 29 November 2009. ^ '미남' 마지막 콘서트, 3천명 구름관중 [A.N.JELL holds its last concert]. Osen (in Korean). 23 November 2009. Retrieved 29 November 2009. ^ "All copies of "Secret Garden" OST have sold out". Allkpop. 2011-01-05. Retrieved 2014-06-04. ^ "Drama soundtrack bit hit around Asia". Hancinema. 2014-03-03. Retrieved 2014-03-04. ^ "Song Kang Ho and Jun Ji Hyun Win Grand Prizes for the Baeksang Arts Awards + Full List of Winners". Soompi. 2014-05-27. Retrieved 2014-05-27. ^ "'미남이시네요' AN.Jell, 실제 가수로 활약?" [You're Beautiful's AN.Jell to work as real singers?]. IS Plus (in Korean). 25 October 2009. Retrieved 29 November 2009. ^ ""IRIS" soundtrack concert attracts fans in Japan". Hancinema. 2010-06-03. Retrieved 2014-06-04. ^ "The Singers That Turn OST Into Hit Songs". KPopStarz. 2014-03-15. Retrieved 2014-06-04. ^ Kim, Su-jin (2009-11-10). "TV 드라마의 등급 분류 기준은?" (in Korean). 매일경제. Retrieved 2014-09-10. ^ a b Larsen 2008. ^ "Korean dramas on Hulu: Why I'm addicted". Entertainment Weekly PopWatch. 2011-02-02. Retrieved 2012-01-17. ^ Oh 2015, p. 142, 147-8. ^ Oh 2015, p. 134. ^ Oh 2015, p. 147. ^ Kang, Myoung-Seok (30 September 2009). "10LINE: Won Bin". 10 Asia. Retrieved 2 December 2012. ^ Kang, Myoung-Seok (4 August 2010). "INTERVIEW: Actor Won Bin - Part 1". 10 Asia. Retrieved 2 December 2012. ^ Kang, Myoung-Seok (4 August 2010). "INTERVIEW: Actor Won Bin - Part 2". 10 Asia. Retrieved 2 December 2012. ^ Kang, Myoung-Seok (4 August 2010). "INTERVIEW: Actor Won Bin - Part 3". 10 Asia. Retrieved 2 December 2012. ^ "K-Drama for Beginners". 24 December 2015. Retrieved 21 October 2018. ^ (KOCIS), Korean Culture and Information Service. "Korean dramas to air during Myanmar New Year : Korea.net : The official website of the Republic of Korea". Retrieved 21 October 2018. ^ "Korean fever strikes Bhutan". InsideAsean. ^ Margherita Stancati. "Does Bhutan Love Bollywood Too Much?". WSJ. ^ "Korean Wave washes over Brunei". The Brunei Times. Archived from the original on 25 November 2015. ^ Faiola, Anthony (31 August 2006). "Japanese Women Catch the 'Korean Wave'". The Washington Post. ^ "The Hallyu Wave Remains Alive in Hong Kong". University of Southern California. 2011-04-05. Retrieved 2012-01-17. ^ Lee, Hyun-Kyung (9 April 2015). "Korean Dramas and Variety Shows, Over Asia to Europe and America". Newspim. ^ "Cosmetics' Hallyu from My Love from the Star". The Korea Herald Economy. 10 March 2015. ^ hermes (27 February 2017). "Thaad row: China blocks streaming of Korean dramas". Retrieved 21 October 2018. ^ "China Becoming Increasingly Protective in Culture Industry". 19 April 2017. Retrieved 21 October 2018. ^ TODAY, ASIA (2 November 2017). "China Virtually Ends Hallyu Ban". Retrieved 21 October 2018. ^ "From movies to hairstyle and even language, it's Korea for the North-East". India Today. Retrieved 21 October 2018. ^ Sunita, Akoijam (4 April 2012). "Korea Comes to Manipur". Caravan Magazine. Archived from the original on 27 April 2012. Retrieved 4 April 2012. ^ "India's northeast mesmerized by South Korea". Agence France-Presse. 4 April 2012. Retrieved 4 April 2012. ^ "KBS Drama "Emperor of the Sea" to Air in India". Hancinema. 2006-02-16. Retrieved 2014-07-16. ^ Ramya Kannan. "Korean serials, the Tamil way". The Hindu. ^ "The Global Impact of South Korean Popular Culture". ^ "Korean TV formats: a new Korean wave?". Daehan Drama. ^ "Improving Korea-Japan relations is possible: look at the Germany-Poland example". 2012-01-18. Retrieved 2014-07-16. ^ "Japanese Surfing the Korean Wave: Drama Tourism, Nationalism, and Gender via Ethnic Eroticisms" (PDF). Southeast Review of Asian Studies. 31: 10–38. 2009. ^ Inoue, Chihiro (13 April 2009). "Spy drama pulls S.Koreans to Akita". The Japan Times. Retrieved 26 April 2010. ^ 이해리 (4 February 2009). 아리가또∼ 아이리스. Donga (in Korean). Retrieved 21 April 2010. ^ "Akita sees huge increase in Korean tourists". Japan Probe. 16 January 2010. Archived from the original on 18 January 2010. Retrieved 23 April 2010. ^ "Lao tourists ride "Korean wave"". MindaNews. ^ "Caught up in a Korean wave". The Star. Retrieved 2014-12-12. ^ "Sorry Page". news.mofat.go.kr. Retrieved 21 October 2018. ^ Diplomat, Jenna Gibson, The. "How Korea Is Conquering Myanmar, One Soap Opera at a Time". Retrieved 21 October 2018. ^ "Korean Dramas Captivate Young People in Nepal". 7 February 2010. Retrieved 21 October 2018. ^ Annette Ekin. "Nepal's cool kids craving the South Korean cutting edge". ^ "North Korea 'Publicly Executed 80 People,' South Korean Paper Reports". The Huffington Post. 2013-11-11. Retrieved 2014-07-16. ^ "Young People Surfing the Korean Wave". The DailyNK. 21 June 2011. Archived from the original on 26 July 2014. Retrieved 16 January 2012. ^ "Korean Dramas Continue to Captivate the Philippines". 6 September 2009. Retrieved 21 October 2018. ^ "Channel U" (in Chinese). XINMSN. Retrieved 2014-07-16. ^ "Singaporeans get quick access to Korean shows with TV channel Oh!K". The Straits Times. Retrieved 2014-12-18. ^ Korean Culture and Information Service (KOCIS). "Popular soap 'Daejanggeum' returns to air after 11 years". ^ "The Korean Wave is on its way". Ceylon Today. Archived from the original on 23 September 2015. Retrieved 16 October 2014. ^ "Sri Lanka offers The Korea Post publisher with Plaque of Appreciation for cooperation". Retrieved 21 October 2018. ^ "Korean drama gains popularity in Taiwan". HanCinema. ^ "Hallyu (Korean Wave) in Thailand". KOFICE. Archived from the original on 25 July 2014. Retrieved 16 July 2014. ^ "Royal Thai Embassy, Seoul > Home > Thailand – ROK Relations > Bilateral relations". Thaiembassy.or.kr. Archived from the original on 22 July 2011. Retrieved 15 August 2011. ^ "Television at Large in South Asia". ^ "Drama on ImaginAsian TV". Archived from the original on 14 October 2006. ^ "[OP-ED] Korean Dramas On Netflix". koogle.tv. Retrieved 21 October 2018. ^ Knock it off: Global treaty against media piracy won't work in Asia Jeff Yang, SFGate, 11 November 2009. ^ http://www.theaureview.com/features/hello-asia-article-the-success-of-k-drama Hello Asia: The success of K-drama, 13 October 2012. ^ "Can fans unravel the Babel of the world's TV dramas?". CNN. 2014-06-09. Retrieved 2014-07-16. ^ "MobiTV.lk - Watch Sri Lankan TV shows on Internet". ^ "PPTV网络电视HD - Android Apps on Google Play". PPLive Corporation. ^ "Winter Sonata". Amazon.com. Retrieved 2014-07-16. ^ "TV Stations Showing Korean TV Dramas". ^ "South Korean TV Ratings: TNmS vs. AGB Nielsen". Soompi. 2011-06-21. Retrieved 2014-09-10. ^ "AGB Nielsen Korea" (in Korean). AGB Nielsen Korea. Archived from the original on 8 February 2015. Retrieved 2014-06-03. ^ Lee Seung Heon (1999-03-22). "보고 또…'여파 9시뉴스 판도 뒤바뀌어". Dong-A Ilbo. ^ "AGB Daily Ratings: this links to current day-select the date from drop down menu". AGB Nielsen Media Research (in Korean). Archived from the original on 1 June 2016. Retrieved 21 January 2017. ^ "Reply 1988 Writes Cable Television History". Stoo Asaie. ^ "종영 '품위녀' 12.1%로 자체 최고 기록..무서운 뒷심". Star News (in Korean). ^ Kim, Tong-hyung (25 February 2013). "Childless Comfort looks like TV game-changer". The Korea Times. Retrieved 2013-03-04. Chosun Ilbo (8 January 2007). "Korean Vs. U.S. Soaps". The Chosun Ilbo. Archived from the original on 2007-01-09. Retrieved 2011-12-19. Donga 1 (1 August 2013). "Inconvenient truth of the Korean drama industry". The Donga Ilbo. Retrieved 2014-06-04. Donga 2 (30 September 2013). "Interview with senior actors about Korean dramas". The Donga Ilbo. Retrieved 2014-06-04. Iwabuchi, Koichi (2008). East Asian pop culture: analysing the Korean wave. Hong Kong University Press. ISBN 9789622098923. Kim, Ju Young (2007). Rethinking Media Flow under Globalisation: Rising Korean Wave and Korean TV and Film Policy Since 1980s (Dissertation). Centre for Cultural Policy Studies, University of Warwick. Retrieved 5 December 2013. Kim, Yang-hee (27 July 2013). "TV producer's suicide causes troubled industry to reflect". The Hankyoreh. Retrieved 2014-06-04. Kim, Yang-hee (4 April 2013). "The unglamorous lives of Korean drama actors". The Hankyoreh. Retrieved 2014-06-04. KOCIS (2011). K-Drama: A New TV Genre with Global Appeal (pdf). KOCIS. ISBN 978-89-7375-167-9. Retrieved 2014-06-02. Korea.net (12 March 2012). "Korea's fusion sageuk". Korea.net. Retrieved 2014-01-19. Larsen, Tom (24 April 2008). "Whetting U.S. appetite for Korean TV dramas". The Korea Herald via Hancinema. Retrieved 2011-01-16. Lee, Yong-cheol (24 January 2014). "The Secret of PERIOD DRAMA". KOFIC. Retrieved 2014-06-02. Lee, Diana (2005). "Winter Sonata Drama fever". UNIORB. Retrieved 2011-12-19. Oh, Youjeong (2015). "The Interactive Nature of Korean TV Dramas: Flexible Texts, Discursive Consumption, and Social Media." In Sangjoon Lee and Abe Mark Nornes. Hallyu 2.0: The Korean Wave in the Age of Social Media. University of Michigan Press. ISBN 978-0-472-07252-1. Robinson, Michael E. (1998). "16: Broadcasting in Korea, 1924–1937: Colonial Modernity and Cultural Hegemony". In Sharon A. Minichiello. Japan's Competing Modernities: Issues in Culture and Democracy, 1900–1930. University of Hawai'i Press. ISBN 978-0-8248-2080-0. Shim, Doobo (2011). Waxing The Korean Wave (pdf). Asia Research Institute, National University of Singapore. Retrieved 2012-01-13. Sung, Sang-Yeon (4 February 2008). "The High Tide of the Korean Wave III: Why do Asian fans prefer Korean pop culture?". Korea Herald. Archived from the original on 2012-03-24. Retrieved 2012-01-12. X (November 2009). "영원한 제국 (Eternal Empire) and Chungmuro's Love-Hate for History". Twitch Film. Archived from the original on 2 June 2014. Retrieved 2 June 2014. X (14 May 2007). "Sageuk, Korea's 80 Year Long Love for History". Yumcha!. Retrieved 2014-06-02. Wikimedia Commons has media related to Television series of South Korea.